A Special Boston Collection - We are excited to share with you a special collection of Meiji era designs, original shin-hanga prints, and high quality reprints. During a recent trip to Boston, we purchased the remaining stock from a gallery specializing in Japanese woodblock prints. This Boston gallery opened in the mid 1920's and went out of business in 1933 during the Great Depression. The original owner's daughter had kept the prints safely stored for more than 75 years! These terrific works are in wonderful condition, looking almost as if they came straight from the publisher. A real treasure trove of pre-WWII prints, with original designs ranging from classic poem slips, serene landscapes, charming birds and flowers, and popular silhouette scenes, to reprints of masterworks by Hiroshige. 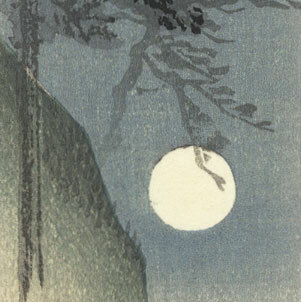 A great opportunity to purchase an excellent early 20th century woodblock at a low Fuji Arts price! Tanzaku Prints - Tanzaku or "poem slip" prints are narrow, vertical format woodblocks with a printed verse or space to write a poem. These charming prints typically feature beautiful landscapes or peaceful nature subjects. This traditional Japanese form dates back hundreds of years, and is still in use today, with tanazaku decorating bamboo branches for the annual Tanabata Festival. Original shin-hanga tanzaku prints have all but disappeared from the market. These classic designs are an excellent opportunity for the serious collector! Image Size - 2" x 9 1/4"
Condition - This print with excellent color and detail as shown. Please see photos for details. Very nice overall.